Welcome back to a time when it was "fun to be fooled". The Chicago Magic Lounge is an experiential night of close-up magic, bar magic, and stage magic. The experience begins from the moment you enter. Your ticket will grant you access to the luxurious "Harry Blackstone Cabaret", our 120 seat theater named for famed Chicago Magician, Harry Blackstone. Once seated, you will experience close-up magic right at your table during the cocktail hour, followed by an hour of stage magic featuring two masters of their craft performing feats of prestidigitation and sleight of hand. Chicago was once home to a style of magic created here in the Windy City. Simply put... bar magic. There were once nine magic bars open at one time in Chicago, with a total of 15 magic bars throughout time. Places where adults would gather for cocktails and card tricks. Yet over time, one by one, they all "disappeared". 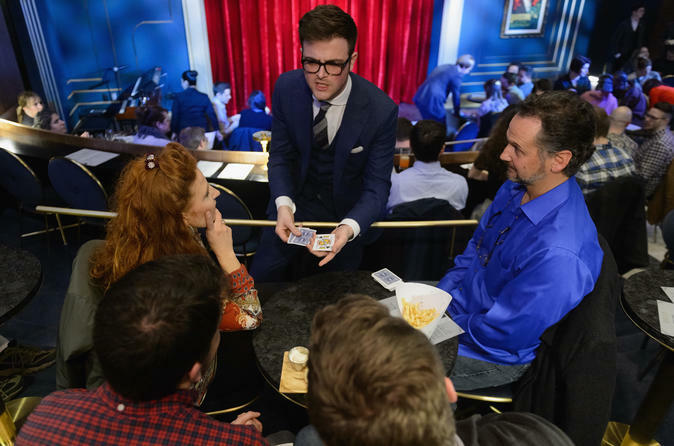 The Chicago Magic Lounge aims at restoring Chicago as a hub for close-up magic, and reinventing the classic magic bar. There are three distinct areas of the Chicago Magic Lounge, the Magic Bar, the Harry Blackstone Cabaret, and the 654 Club. The Magic Bar opens daily at 5:00pm and features signature, and classic cocktails, and a magician to entertain you throughout the night. The Harry Blackstone Cabaret is our crown jewel, an Art-Deco inspired cabaret theater with elevated seating, a sunken in front row, and the exclusive Mezzanine which overlooks the main room. The 654 Club is a raked, 43 seat theater dedicated to the art of close-up magic. With your ticket, you may arrive as early as you would like to enjoy the magic at the bar, and begin a night of cocktails. At 7:30pm, we open the secret door within the Library, and once you take your seat, close-up magicians will be sent over to your section, and you will witness magic up close and personal. As we say, "Chicago Style". The first hour of the night is our cocktail hour, with roaming magicians, with delectable small bites, and hand crafted cocktails, wine, or beer for purchase. The second hour is spent with two magicians on stage, some local, some out of town, all that will astound you. If you would like to check availability for the 654 Club which seats after the main show is over, just ask your server for tickets! The Chicago Magic Lounge is not just a magic show. It's an atmospheric experience with magic everywhere. With our magicians library, rare artifacts, historic images, secret doors, and magic in three separate areas, you will have a once in a lifetime experience. One Note: Don't take everything as it seems, and don't second guess the laundromat. Misdirection is everywhere.